Where did May go to? Wow that month just flew past didn't it? I've also realised this is my 100th post on the blog. Note to self: keep up the good work! I've slowed down in my finish it up frenzy, but I've still been busy. This time, it's been commission work, getting paid for my hobby, which is always good! I've been sensible and after speaking to the Taxman last year. I'm keeping notes of money in and out. 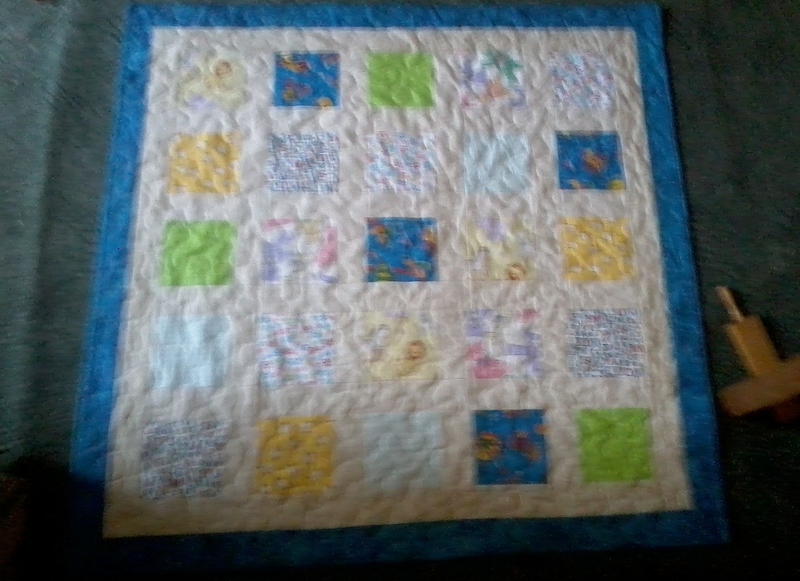 First of all I was asked to make a baby boy quilt, which I did last weekend, but unfortunately, the battery died in the camera, so you'll have to make do with this rubbish photo from my phone instead. It's really not your eyes, it IS the photo! I just went with juvenile prints, sashed with cream , backed and bound in blue batik. It was quilted in a large meander in a cream cotton. Cute enough, and worth every penny I got for it! This weekend was Quilts UK in Malvern, but as there were notices everywhere asking visitors not to post photos to websites, I feel I should comply, so no pretty pictures. I have to admit I was slightly disappointed with the overall winner, and preferred the second place quilt﻿, but fully understand this is a personal view that not everyone agrees with, certainly not the judges, and they're the ones who count in this instance. Maybe I should think about entering next year as I'm such an "expert". I brought back plenty of goodies, everything on my list and only threads as extra impulse purchases. Two 7500 yard cops of piecing thread...a bit linty, but it's what I use for everything when I'm piecing. I bought the same offer in Birmingham about 6 years ago, and have around 1/4 of a cop left...I used to use it for thread basting, so amazing value in there. I also got some pink and cream FQs (no pictures, I've used most of them already), some purple sparkly thread (that was a freebie for leaving my name & address with a stand holder), border stencil design with scoopy swirls and hearts, to be featured in a Very Important Quilt very soon. I got a tiny brass stencil which I'm going to use in my labels from now on with fabric ink as a mini logo. It's 4 hearts surrounded by leaves, and I can stamp the ink right on it to make a colourful logo. Might need a practice first! The best purchase was a bag of 50 reels of rayon thread for less than 50p each! I shared a "Two bags for £45" offer with a friend. She was the smart one and bought a thread box to store them in! The other news I can share is I've been asked to make a pink & white/cream quilt for someone, in additional to the existing pink & cream commission. I think I've got a design picked out for that one. The previous commission has been cut out and awaits me starting to piece it. I can't say anything about the other Very Important Quilt, except I can't wait to start on it...or I could even say finish it as I pieced the top some time ago. My lips are sealed until it's complete. Ooops missed my self declared deadline for finishes, but I've been working hard at the sewing machine. So, who's ready to see the big reveal and final tally? I'm declaring 4 more finishes, with another one which will be done tonight. Finish 1: Sashiko sampler. 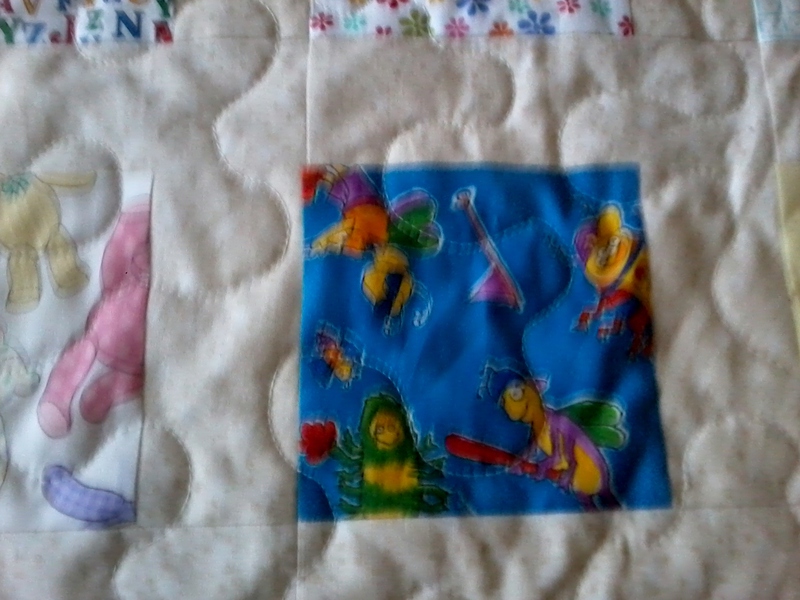 I bought this at my first trip to the Festival of Quilts in Birmingham, in about 2003. I started working on it straight away, did the green outer border and inner dividing lines and the top left square, then stuck it in a drawer. I kept looking at it and working another thread's worth of stitching, then back to the drawer it went. I'm really not a fan of handwork! When I set myself this mini challenge, I rediscovered this piece, and got it finished in an evening. I had to cobble the mount together as there were no square frames in my budget, but it;s not too bad, and even better, it's only pritt sticked together, so if I find a nicer frame I can remove it and re-frame it. Finish 2: I'd not even started this piece this time last week, but was browsing through some old magazines and saw the cockerel pattern as part of a larger wall hanging in an Australian magazine. I've got a friend going through a rough time right now, and as she and her husband rescue ex-bettery chickens, thought (hoped) this would raise a smile. It's bondawebbed and machine button hole stitched, with small swirl quilting and a looped hanger. I've checked my visitors' locations, and haven't spotted hers in there yet, so think I'm safe in posting it here before I've posted it to her! Finish 3 is my Basket of Logs quilt, the Guide trip fundraiser. All labelled and ready for taking up to them tonight. I've written a little note with some facts about it that they might consider as fundraising ideas...how long it took, how many different fabrics, how many individual pieces of fabric. Of course, however they choose to use it is fine by me! Finish 4 is that I sewed some binding onto the sample quilting piece for the Basket of Logs and am using it as a hot pad on the kitchen counter. This will be finished after the weekend...it's half a sock from the Frome yarn. I'm not sure when its mate will arrive! Other things I've got on the machine or sewing table just now include a siggy quilt for my daughter, a baby quilt for my cousin's daughter (needs to be done by Friday morning, but only needs the binding slip stitching down and labelling), I need to work up some designs for a kingsize quilt with hearts in for a commission, and also a commissioned baby quilt﻿ to make by the end of May. I'm declaring 4 finishes this weekend. Finish 1: skinny quilt for the BQL challenge. Techincally I finished this twice. I got it quilted and bound, then decided I really didn't like the way the setting triangles "bled" into the binding. There was no definiate edge to the on point blocks. I slept on it overnight and oddly dreamt how to tweak it. Next morning, I carefully took the binding off, appliqued the mauve strips over the egdes to look like a slim border, then re-applied the binding. much better! Finishes 2 and 3 were mini Christmas table runners/counter covers. I'd totally forgotten about these as they were over the top bannister with another UFO covering them! I thought about a Christmas bauble theme quilting, but, to be honest, I just wanted them finished and out of the UFO pile, so in the end I straight stitched in the centre of each strip in a selection of metallic threads. I bound each of them with some leftover binding from the sweetie jar, and machined in the ditch on the front to finish the binding off. Not my best work by a long way, but a kill's a kill. Finish 4 had already been in a show, but I realised I wanted to add in the ditch quilting around each siggy square. This was the quilt which was hiding the Christmas runners on the bannister. I'd done all the in the ditching, just had to bury the ends...139 squares, one pass round each one, front and back thread...that's a lot of ends to bury. I poured myself a big glass of wine, took a deep breath and just got on with it. It was done in two sessions, and the quilt is now folded and back inthe store cupboard. I bring it out to use as an example of a siggy quilt. My favourite thing about it, apart from the collection of signatures from around the world is the rainbow shading of the patches. The final picture isn't a finish...yet. It's a trial to see how my planned quilting design will look on the Guide quilt. Cunningly, I also used two of my less favourite fat quarters...the orange top one is nothing compared to the multi-coloured monstrosity that lies beneath! Tea break over, I'm about to start work on the Guide quilt...I've had best part of a month to do it, and need it for tomorrow evening! Just as well I'm off work, and apart from a blood test and returning a top to the shop, have a clear sewing day. I'll report in on Wednesday on how I've done with it. 2 more past the finish post. This is going to be a very quick post, life's suddenly got incredibly busy, but I wanted to share my latest two finishes with everyone. I'm thrilled with how he's turned out! I'm especially pleased with the shading on his back, and with how well the quilting went. I was aiming for a watery feel to it, and used a YLI blue/multi thread. I'll be using this one again for Hannah's Guide quilt. Finish two is Candy Boxes, a commissioned bed quilt. Nice gentle loopy quilting with free motion hearts interspersed throughout it in a pale pink Robison Anton thread. This should be off to its new home tomorrow. And just because it's nearly Easter, here's a chocolate cake that Hannah made and iced herself. Not so much of it left now! I'm on leave from work next week and with a combination of Easter and the Royal Wedding, I'm using 4 days' leave and having 11 away from work. I've decided that during my time off I'll be trying to finish as many projects as possible. I'm aiming for a finish per day but not all of them will be full sized quilts. I've got a couple which just need threads burying, 2 which need to be layered and quilted, 1 to be quilted, and at least 1 to finish piecing. I'd quite like to get a head start on my sample pieces for Sound Stitchers Christmas in June 4-Corners evening, and also make up a couple of notebook covers from the pattern I bought at Anya Townrow's workshop. We'll see how the finishes line up, I'll count up in the afternoon of May Day Bank Holiday. Last night was the April meeting of Sound Stitchers, Helen was leading us in ideas to use up your charm packs...you know those packs of precut fabrics that all go together, that tempt us at shows and in shops. Yup, there I go...easily tempted! So last night, armed with a plain pack and print pack in an autumnal clourway from Strawberry Fayre and my machine, off I set. We explored HSTs in all their different settings, quarter square triangles to use as sashing cornerstones, and disappearing nine, four and sixteen patches. I made a couple of broken dishes set HSTs and chain pieced another four pairs ready for pressing and trimming. No matter how carefully I piece, I simply can't get my seams dead on for making identical pairs, so rather than struggle and rip seams out time and again, I relax, press the block and square it up before piecing them together. Sure I end up with blocks a tiny smidge smaller, but they all fit together and I don't end up with a wonky quilt. BQL skinny challenge. Needs to be quilted, and trimmed to size. Not 100% sure how to do it, but I need to hurry up, it has to be posted on the group by next weekend. Candy Boxes commissioned quilt. Just need to finish slip stitching the binding down and add a label. .Guide fundraiser. Hannah's not back at Guides until after Easter, so I've got 2 weeks to work on it. I'll bind it in the blue batik I used for backing. My excuse is I didn't have enough of any other fabric used on the front. I have no excuses or explanation for the expression in the photo! I got home from the meeting to find a letter from hospital "asking" me to my six monthly check up and blood tests in mid May. Fingers crossed they all come back as they have in the rest of the year since my last op. It's Mother's day here in the UK (You know I'm never 100% sure where the apostrophe goes...Is it a day for all Mothers in which case after the S, or is my personal Day, in which case, before. I've written it both ways here, just to annoy any pedant reading). Anyway, I choose to spend my Day by quilting and sewing. I finished piecing the Guide Fundraiser top last night, and am really pleased with how it turned out. I'm especially pleased with the coloured log cabin border. Less pleased that it was only as I laid the blocks out ready to assemble that I realised I can't count and needed to whip up another 4! Still all done now. I've pieced the backing, a blue batik, and put the wadding aside ready for sandwiching this afternoon. I decided to wash the backing, which I don't generally do these days, as it's a deep blue batik, and just "felt" that it had excess dye still in it. With there being so many neutral strips on the front, and it being a fundraiser quilt, the last thing I wanted ﻿is its new owner washing it and having blobs of blue run through. Naturally I didn't have enough of the mauve basket fabric to bind it, and the substitute mauve I found was too short as well. I'll be using strips from the backing fabric instead. The other quilt I'm working on today is the pink and white one which I was commissioned to make for a former work colleague's step daughter. It's currently sandwiched and waiting for me to close the pins and put the straight line quilting on it. Once that's done, I'll be using apale pink thread to free motion swirls and loops with hearts all over it. The stash busting is looking good this week, as I decided not to count what I use until I'm at the actual quiltng stage of a piece. So two quilts ready for the machine, 16 yards of fabric used up!! Again, I calculated the yardage of the tops by weighing them. Smidge over 4 yards for the pink and white one, smidge under for the yellow and blue one. 4 yards each for backing. My stash busting is so busted! It's never a good idea to visit a quilt show the day after payday, but I did it today! My local show is an hour's drive away, and Mr Kwilter volunteered to be driver and bag carrier, so not wanting to refuse an offer like this, I ordered a roll of wadding from Lady Sew and Sew...expensive, but no postage to pay, and the roll will last me a good year to 18 months. I'd planned to browse the exhibits, pick up my wadding and a new cutting board, then head home...How wrong I was!! I love it!! Jan B pieced the background, I appliqued the lighthouse and words, and Helen quilted it. Our name and contact details are on the back, so if people attend the show and would like to join us, the info's all right there. We'll get it back after the AGM in mid April, but the Guild would like to have them each year for their stand. I think the general group agreement is that we'll be making another one to hang at our own meetings, coffee mornings and shows. This pic shows a metre of calico for labels and hanging sleeves, a bobbin of fine thread to use in my bottom bobbin, 3 new rotary blades, essential replacement, a skein of sashiko thread to go with some blue batik to make a slouch bag with﻿. (not the blue batik above, some I bought in Bovey Tracy). Diane Gaudinski machine quilting guide, I bought this for my former quilt group, and loved it so much, I wanted my own copy. The cutting board everything's lined up on is new as well, my old one was getting just too warn and warped. Finally, the roll of wadding, not very glamorous, but certainly essential equipment. I've been quilting for around 10 years. I'm gradually becoming more confident in my abilities and had some of my work in my quilt group's summer exhibition. I'm fighting a losing battle to only buy fabric for specific projects and to finish some of my UFOs I want to get under 2:20 for a half marathon, sub 60 10K and run my first marathon. I've also recently been diagnosed with thyroid cancer. Linda's pink & white quilt. Sound Stitchers Chairman's Challenge. Most of applique finished. commissioned hearts king size quilt. Designed and cut out. Crazy swap piece. Victim 1 embellished. HST madness quilt. 3 blocks worth of HSTs squared up. Laceweight scarf. Row 5 of repeat 2 done. Work out what to do with pineapple blocks. Assemble and quilt. Japanese snowball. All corner pieces sewn on, trimmed and pressed.